Appearance: ( 8 )Deliciously melty, mottled cheese with a sprinkling of spicy chopped green…something. A few tomatoes peek through. Salsa and sour cream (not pictured) arrived on the side. Sadly, a bit of char brought them down a few points. Quality of Ingredients: (5) Good cheese, decent chips, but not much else stood out. There were some very spicy peppers hidden in the midst which caused a minor crisis, as the waiter had neglected to bring our beverages. Overall, these just weren’t that good or memorable. Distribution of Toppings: (5) The idea of layering clearly never crossed the chef’s mind. 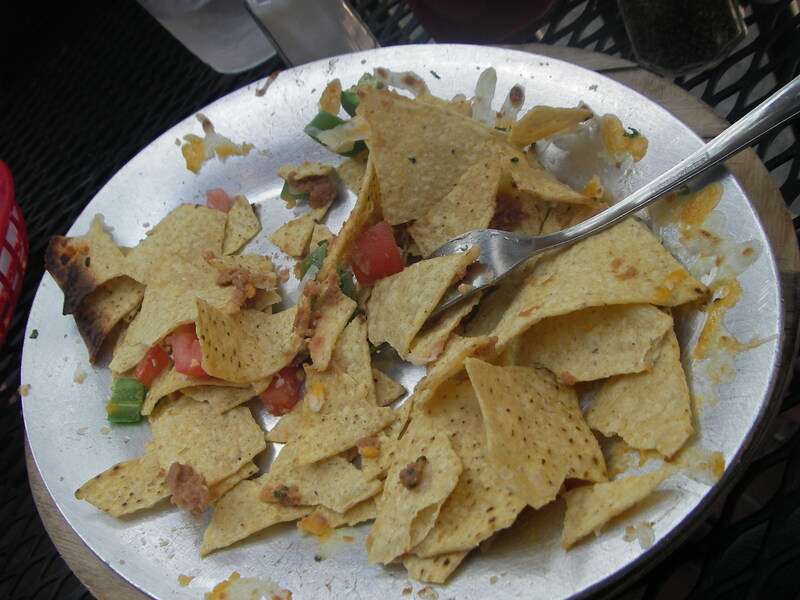 One solid layer of cheese on top of several layers of chips does not a good nacho make. Adding insult to injury, most of the chips on the bottom were broken into pieces too tiny to be at all helpful in scooping up stray toppings. After exhausting all of the tasty bits, we were left with a depressingly full, boring plate. Price:(7) $7, which wasn’t too bad. We didn’t finish them, only because we really didn’t want to. We don’t, however, appreciate that adding chicken would have brought them up to $12. That had better be some damn fine chicken…. Overall: 25. The Trident is a great indie treasure on Newbury Street, and much of their menu looks delicious and inventive. 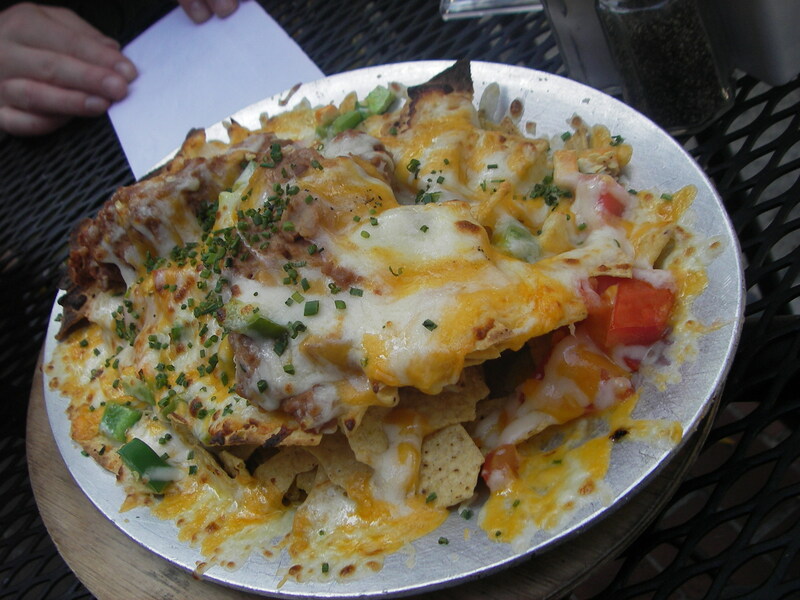 It’s a shame that they went the boring, generic route with these nachos. They should do everyone a favor (and heed the Border Cafe, for once) and just take them off the menu. The green chopped stuff is green onion. I use them in my own nachos. They don’t add much flavor but they add great color. Wow, it’s probably been ten years since I even thought of the Trident. I had breakfast there with a swiss banker’s daughter and another German girl who’s brother loved nachos (I made him some the day before he moved back to Germany).